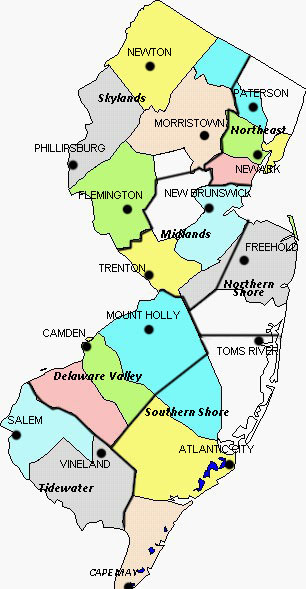 If northeastern New Jersey constitutes most people's image of the state, Salem and Cumberland Counties are the least likely to spring to mind when thinking of New Jersey. This is an area of farms, small towns, tidal marshes and winding streams, with only the Cumberland cities of Bridgeton, Millville and Vineland to break the bucolic atmosphere. In many of the Tidewater towns, time seems to have stood still; the entire village of Greenwich is a historic district. As you might expect, history abounds here, at Fort Mott State Park, where fortifications built as a Spanish-American War defense maintain a ghostly watch on the Delaware, at Hancock House, where colonial troops were massacred by British soldiers during the Revolution, and at many of the 18th-century patterned-brick houses still standing throughout both counties. New Jersey's first zoo is also here, as is an authentic Western rodeo. Most attractions are linked to their websites. Information given is as accurate as possible, but it is always advisable to check with the facility. The descriptions noted for each attraction are for information only and do not constitute an endorsement. Performances feature traditional rodeo activities, including bull riding, steer wrestling, roping and barrel racing. Northbound, US 40 East/Atlantic City Exit. Continue 6 miles on US 40 East to rodeo on right. Southbound, After passing through toll booth at end of Turnpike, take NJ 140/Co 540/Penns Grove/Deepwater Exit. Turn left on Hawks Bridge Rd., cross under Turnpike and continue to first light. Turn left onto US 40 East (sign for Atlantic City) and go 6 miles to rodeo on right. Northbound, after leaving Delaware Memorial Bridge, follow signs for New Jersey Turnpike. Continue 3/4 mile on Turnpike to US 40 East/Atlantic City Exit. Continue 6 miles on US 40 East to rodeo on right. Southbound, Exit 4, turn left and go 3 miles east on NJ 48 to end. Cross US 40 westbound lanes and merge onto US 40 East. Continue east 2 miles to rodeo on right. From NJ 45, in Pilesgrove Township, at traffic light at US 40, Northbound, turn left (Pilesgrove Town Center on left), Southbound, turn right (Lawnside Cemetery on right), onto US 40 West and continue 2 1/4 miles to rodeo on left. Two-hour cruises travel the Maurice River, which has been designated a Wild and Scenic River, from Union Lake in Millville to Delaware Bay with opportunities to observe the scenery and wildlife, including bald eagles. Northbound, US 40 East/Atlantic City Exit, continue 22 1/2 miles on US 40 East through Woodstown and Elmer to NJ 55 South/Vineland/Millville/Cape May Exit. Merge onto NJ 55 South and continue 12 1/2 miles to Exit 26, then follow NJ 55 Southbound directions below. Southbound, Exit 3, follow signs for NJ 168 North/Camden/Philadelphia. Merge onto NJ 168 North and continue 1 mile to I-295 South/Walt Whitman Bridge/Delaware Memorial Bridge Exit. Merge onto I-295 South and continue 2 miles to NJ 42/Atlantic City Exit. Merge onto NJ 42 South and continue 1 1/2 miles to Exit 13. Follow NJ 55 South 33 miles to Exit 26, then follow NJ 55 Southbound directions below. Northbound, after leaving Delaware Memorial Bridge, follow signs for New Jersey Turnpike. Continue 1 mile, then take US 40 East/Atlantic City Exit. Continue 22 1/2 miles on US 40 East through Woodstown and Elmer to NJ 55 South/Vineland/Millville/Cape May Exit. Merge onto NJ 55 South and continue 12 1/2 miles to Exit 26, then follow NJ 55 Southbound directions below. Southbound, NJ 42/Atlantic City Exit (after Exit 26), merge onto NJ 42 South and continue 1 1/2 miles to Exit 13. Follow NJ 55 South 33 miles to Exit 26, then follow NJ 55 Southbound directions below. Northbound, Exit 24, turn left onto NJ 49 West/E. Main St. and continue 1 1/2 miles to traffic light at Ware Ave. (fourth light after crossing railroad) in Millville. Turn left onto Ware Ave. and continue to dock on right. Park in lot across the street. Southbound, Exit 26, turn right onto Co. 555 South/Wheaton Ave. and continue 1 1/2 miles into Millville to stop sign at N. Third St. Bear left onto N. Third St. and continue 1/2 mile to second light. Turn right onto E. Main St. and continue 1/4 mile to third light. Turn left onto Ware Ave. and continue to dock on right. Park in lot across the street. Eastbound, in Franklin Township, NJ 55 South/Vineland/Millville/Cape May Exit. Merge onto NJ 55 South and continue 12 1/2 miles to Exit 26, then follow NJ 55 Southbound directions above. Westbound, after passing junction with NJ 50 South in Mays Landing, continue 1 1/2 miles to second light. Turn left (sign for Co. 552 West/Milmay/Millville/Vineland on right) and continue to T intersection, then turn right and follow Co. 552 West 14 1/2 miles (at Sherman Ave., Co. 552 turns right; continue straight on Spur Co. 552). At first light after crossing under NJ 55, turn left onto Wade Blvd. and continue 1/2 mile. Bear right (sign for NJ 49 West/Bridgeton/Salem on right) onto NJ 49 West/E. Main St. and continue 1 mile to fifth light. Turn left onto Ware Ave. and continue to dock on right. Park in lot across the street. Northbound, in Millville, after passing Glasstown Residence at River Park on left, take next left onto Ware Ave. and continue 1/4 mile to boat landing. Southbound, in Millville, at traffic light at NJ 49/E. Main St., turn right onto NJ 49 West/E. Main St. and continue to second light. Turn left onto Ware Ave. and continue to boat landing. From NJ 49, in Millville, at traffic light at Ware Ave./Buck St., Eastbound, turn right (first light after crossing Maurice River), Westbound, turn left, onto Ware Ave. and continue to boat landing. Begun as a center for arts education in 1960, Appel Farm has grown to a multimedia arts center. Live performances are featured, as are classes and workshops in all areas of the arts. Northbound, US 40 East/Atlantic City Exit, continue 8 1/4 miles on US 40 East to junction with NJ 45. Turn left, following signs for US 40 East and continue 6 1/2 miles through Woodstown to traffic circle at junction with NJ 77 (Point 40 Diner on right). Take third exit from circle to stay on US 40 East and continue 3 1/2 miles to traffic light in Elmer. Turn right onto S. Main St. and continue 1 mile. When road forks, keep to right of traffic island and continue to stop sign. Turn right onto Co. 611/Shirley Rd. and continue 1 mile to Appel Farm on left. Southbound, Exit 3, keep right on ramp and follow signs for NJ 168 North/Camden/Philadelphia. Merge onto NJ 168 North and continue 1 mile to I-295 South/Walt Whitman Bridge/Delaware Memorial Bridge Exit. Merge onto I-295 South and continue 1 1/2 miles to NJ 42/Atlantic City Exit, then follow I-295 Southbound directions below. Northbound, New Jersey Turnpike/US 40 East/Atlantic City/New York City Exit, continue 1 mile on New Jersey Turnpike to US 40 East/Atlantic City Exit, then follow New Jersey Turnpike Northbound directions above. Southbound, NJ 42/Atlantic City Exit (after Exit 26), continue 1 1/2 miles on NJ 42 South to Exit 13. Follow NJ 55 South 15 miles to Exit 45. Turn right onto Co. 553 South and continue 1 1/2 miles. After passing Garrison Lake, take next right (sign for Co. 611) onto Dutch Row Rd. and continue 3 1/4 miles to third stop sign. Bear right onto Centerton Rd. and continue 1/4 mile past Elmer Lake. Bear left at next intersection, then continue straight on Co. 611/Shirley Rd. 1 mile to Appel Farm on left. Eastbound, in Upper Pittsgrove Township, 1 3/4 miles past NJ 77 junction, turn right onto Co. 677 South/Burlington Rd. (small sign for Grace Bible Church) and continue 1 3/4 miles to stop sign. Turn right onto Co. 611/Shirley Rd. and continue 1/2 mile to Appel Farm on left. Westbound, in Elmer, continue through traffic light, then take first left onto Front St. and continue 3/4 mile to stop sign. Bear right onto State St. and continue 1/4 mile to next stop sign. Bear right onto Co. 611/Shirley Rd. and continue 1 mile to Appel Farm on left. From NJ 77, in Upper Pittsgrove Township, at blinker light at Co. 611/Shirley Rd., Northbound, turn right (small sign for Appel Farm on right), Southbound, turn left (small sign for Appel Farm on left), onto Co. 611 East/Shirley Rd. and continue 2 1/4 miles to farm on right. Originally the Little Theatre of Vineland, the Cumberland Players are an amateur troupe presenting dramatic, comedy and musical works. Northbound, US 40 East/Atlantic City Exit, continue 22 1/2 miles on US 40 East through Woodstown and Elmer to NJ 55 South/Vineland/Millville/Cape May Exit. Merge onto NJ 55 South and continue 9 3/4 miles to Exit 29, then follow NJ 55 Southbound directions below. Southbound, Exit 3, follow signs for NJ 168 North/Camden/Philadelphia. Merge onto NJ 168 North and continue 1 mile to I-295 South/Walt Whitman Bridge/Delaware Memorial Bridge Exit. Merge onto I-295 South and continue 1 1/2 miles to NJ 42/Atlantic City Exit (after Exit 26). Merge onto NJ 42 South and continue 1 1/2 miles to Exit 13. Follow NJ 55 South 30 miles to Exit 29, then follow NJ 55 Southbound directions below. Northbound, after leaving Delaware Memorial Bridge, follow signs for New Jersey Turnpike/US 40. Continue 1 mile to US 40 East/Atlantic City Exit. Continue 22 1/2 miles on US 40 East through Woodstown and Elmer to NJ 55 South/Vineland/Millville/Cape May Exit. Merge onto NJ 55 South and continue 9 3/4 miles to Exit 29, then follow NJ 55 Southbound directions below. Southbound, NJ 42/Atlantic City Exit (after Exit 26), merge onto NJ 42 South and continue 1 1/2 miles to Exit 13. Follow NJ 55 South 30 miles to Exit 29, then follow NJ 55 Southbound directions below. Northbound, Exit 26, turn right onto Co. 555 North/S. Main Rd. and continue 1 1/2 miles to third light. Turn left onto E. Sherman Ave. and continue 3/4 mile to theater on right, just before first light. Southbound, Exit 29, turn right onto W. Sherman Ave. and continue 2 miles into Vineland. Theater is on the left, after crossing railroad tracks. Eastbound, in Franklin Township, NJ 55 South/Millville/Vineland/Cape May Exit. Merge onto NJ 55 South and continue 9 3/4 miles to Exit 29, then follow NJ 55 Southbound directions above. Westbound, after passing junction with NJ 50 South in Mays Landing, continue 1 1/2 miles to second light. Turn left (sign for Co. 552 West/Milmay/Millville/Vineland on right) and continue to T intersection, then turn right and follow Co. 552 West 12 miles. Turn right onto E. Sherman Ave. (sign for Co. 552 West on right) and continue 4 miles to theater on right in Vineland. From NJ 47, in Vineland, at traffic light at Co. 552/W. Sherman Ave. (sign on right for Milmay), Northbound, turn right, Southbound, turn left, onto Co. 552 East/W. Sherman Ave. and continue 3/4 mile to theater on left, just past railroad crossing. Performances in the areas of comedy, drama, music and dance are presented in a structure built in the early 20th century. Children's programs are also offered. Northbound, US 40 East/Atlantic City Exit, continue 22 1/2 miles on US 40 East through Woodstown and Elmer to NJ 55 South/Vineland/Millville/Cape May Exit. Merge onto NJ 55 South and continue 11 1/2 miles to Exit 27, then follow NJ 55 Southbound directions below. Southbound, Exit 3, follow signs for NJ 168 North/Camden/Philadelphia. Merge onto NJ 168 North and continue 1 mile to I-295 South/Walt Whitman Bridge/Delaware Memorial Bridge Exit. Merge onto I-295 South and continue 2 miles to NJ 42/Atlantic City Exit. Merge onto NJ 42 South and continue 1 1/2 miles to Exit 13. Follow NJ 55 South 32 miles to Exit 27, then follow NJ 55 Southbound directions below. Northbound, after leaving Delaware Memorial Bridge, follow signs for New Jersey Turnpike. Continue 1 mile, then take US 40 East/Atlantic City Exit. Continue 22 1/2 miles on US 40 East through Woodstown and Elmer to NJ 55 South/Vineland/Millville/Cape May Exit. Merge onto NJ 55 South and continue 11 1/2 miles to Exit 27, then follow NJ 55 Southbound directions below. Southbound, NJ 42/Atlantic City Exit (after Exit 26), merge onto NJ 42 South and continue 1 1/2 miles to Exit 13. Follow NJ 55 South 32 miles to Exit 27, then follow NJ 55 Southbound directions below. Northbound, Exit 24, turn left onto NJ 49 West/E. Main St. and continue 1 1/2 miles to traffic light at High St. (third light after crossing railroad) in Millville. Turn right onto N. High St. and continue 2 blocks to theater on left. Park in street or local lots. Southbound, Exit 27, merge onto NJ 47 South/N. Second St. and continue 1/2 mile. Bear right onto N. High St. (Target on right) and continue 1 1/2 miles to theater in Millville on right, after passing Pine St. Park in street or local lots. Eastbound, in Franklin Township, NJ 55 South/Vineland/Millville/Cape May Exit. Merge onto NJ 55 South and continue 11 1/2 miles to Exit 27, then follow NJ 55 Southbound directions above. Westbound, after passing junction with NJ 50 South in Mays Landing, continue 1 1/2 miles to second light. Turn left (sign for Co. 552 West/Milmay/Millville/Vineland on right) and continue to T intersection, then turn right and follow Co. 552 West 14 1/2 miles (at Sherman Ave., Co. 552 turns right; continue straight on Spur Co. 552). At first light after crossing under NJ 55, turn left onto Wade Blvd. and continue 1/2 mile. Bear right (sign for NJ 49 West/Bridgeton/Salem on right) onto NJ 49 West/E. Main St. and continue 1 mile to fourth light. Turn right onto N. High St. and continue 2 blocks to theater on left. Park in street or local lots. Northbound, in Millville, at traffic light at NJ 49/Main St., turn left onto NJ 49 West/E. Main St. and continue to first light. Turn right onto N. High St. and continue two blocks to theater on left. Park in street or local lots. Southbound, in Millville, at E. Pine St. (First United Methodist Church on left), turn right onto E. Pine St. and continue one block. Turn left onto N. High St. Theater is on the right. Park in street or local lots. From NJ 49, in Millville, at traffic light at High St., Eastbound, turn left, Westbound, turn right, onto High St. and continue 2 blocks to theater on left. Park in street or local lots. Art center offers exhibitions of artists' works in several media. Northbound, Exit 10, turn left on Stone Harbor Blvd. and go 1/4 mile to first light. Cross US 9 and continue five miles on Courthouse-Dennisville Rd./Co. 657 North to end. Turn right on NJ 47 North and go 18 miles to Port Elizabeth. Follow signs for NJ 55 North and continue 4 1/2 miles on NJ 55 to Exit 24, then follow NJ 55 Northbound directions below. Southbound, Exit 38A, merge onto Atlantic City Expwy. West and continue 4 miles to Exit 12, then follow Atlantic City Expwy. Westbound directions below. Northbound, US 40 East/Atlantic City Exit. Continue 26 miles on US 40 East to NJ 55 South/Vineland/Millville/Cape May Exit. Merge onto NJ 55 South and continue 11 miles to Exit 27, then follow NJ 55 Southbound directions below. Southbound, Exit 3, follow signs for NJ 168 North/Camden/Philadelphia. Merge onto NJ 168 North and go 1 mile to I-295 South/Walt Whitman Bridge/Delaware Memorial Bridge Exit. Merge onto I-295 South and continue 2 miles to NJ 42/Atlantic City Exit (after Exit 26). Follow NJ 42 South for 1 1/2 miles to Exit 13. Merge onto NJ 55 South and continue 33 miles to Exit 27, then follow NJ 55 Southbound directions below. Eastbound, Exit 28, turn right on NJ 54 South and continue 9 miles to traffic light at US 40. Cross US 40 and continue on Wheat Rd. 1/4 mile. Take first left onto Lincoln Ave. and continue 8 miles to end in Vineland. Turn left on S. Main Rd./Co. 555, cross over NJ 55 and continue 1 1/4 miles on Wheaton Ave. to end. Turn left on N. Third St. and go 1/2 mile to second light. Turn right on E. Main St./NJ 49 West and continue to second light. Turn right on N. High St. and continue to center on left. Westbound, Exit 12, after passing through toll plaza, turn left at the next light onto S. Wrangleboro Rd./Co. 575 and get in right lane. At the next light, turn right onto US 40/US 322 West, staying in right lane. Go through next light, then take jughandle following signs for US 40 West/Mays Landing. Cross US 322 and continue 5 miles into Mays Landing. In Mays Landing, turn left onto Cape May Ave. to stay on US 40 and continue 2 miles to the fourth light. Turn left onto Co. 552 West/Millville Rd. and continue 15 miles into Millville (at Sherman Ave. in Millville, Co. 552 becomes Spur Co. 552). Cross under NJ 55, then turn left at first light onto Wade Blvd./Co. 678. Continue 1/2 mile and just before first light, bear right onto E. Main St./NJ 49 West and continue 1 mile to traffic light at N. High St. (sign for Millville Business District on right). Turn right on N. High St. and continue to center on left. Northbound, Exit 24, turn left on E. Main St./NJ 49 West and go 1 1/2 miles to traffic light at N. High St. (sign for Millville Business District on right). Turn right on N. High St. and continue to center on left. Southbound, Exit 27, turn right on N. Second St./NJ 47 South and continue 2 1/4 miles to traffic light at Main St./NJ 49 (just past Central Baptist Church on left) in Millville. Turn right on E. Main St./NJ 49 West and go to first light. Turn right on N. High St. and continue to center on left. Eastbound, in Franklin Township, NJ 55 South/Vineland/Millville/Cape May Exit. Merge onto NJ 55 South and continue 11 miles to Exit 27, then follow NJ 55 Southbound directions above. Westbound, in Hamilton Township, after passing through Mays Landing, at traffic light at junction with Co. 552 (sign on right for Co. 552 West/Milmay/Millville/Vineland), turn left onto Co. 552 West/Millville Rd. and continue 15 miles into Millville (at Sherman Ave. in Millville, Co. 552 becomes Spur Co. 552). Cross under NJ 55, then turn left at first light onto Wade Blvd./Co. 678. Continue 1/2 mile and just before first light, bear right onto E. Main St./NJ 49 West and continue 1 mile to traffic light at N. High St. (sign for Millville Business District on right). Turn right on N. High St. and continue to center on left. From NJ 47, in Millville, at traffic light at NJ 49/E. Main St., Northbound, turn left, Southbound, turn right onto NJ 49 West/E. Main St. and continue to first light. Turn right onto N. High St. and continue to center on left. From NJ 49, in Millville, at traffic light at High St., Eastbound, turn left, Westbound, turn right, onto High St. and continue 1/2 block to center on left. Cumberland County village in southern New Jersey virtually unchanged from early 19th century. Gibbon House, built in 1730 in Flemish Bond style, has period furnishings. Adjacent are Barn Museum, containing farming implements, 19th-century doctor's office and Swedish Granary. Pirate House shelters the Cumberland County Historical Society papers and the Maritime Museum. Northbound, after leaving Delaware Memorial Bridge, follow signs for I-295 North to Exit 1C, then follow I-295 Northbound directions below. Southbound, Exit 3, follow signs for NJ 168 North/Camden/Philadelphia. Merge onto NJ 168 North and continue 1 mile to I-295 South/Delaware Memorial Bridge/Walt Whitman Bridge Exit. Merge onto I-295 South and continue 2 miles to NJ 42 South/Atlantic City Exit (after Exit 26), then follow I-295 Southbound directions below. Northbound, Exit 1C, merge onto Co 551 South/N. Hook Rd. and continue 4 1/2 miles to end. Turn left onto NJ 49 East and continue three miles into Salem. At first light after crossing Salem River, turn left to stay on NJ 49 East and continue 13 miles through Quinton to Shiloh. At blinker light in Shiloh, bear right (not sharp right) onto Roadstown Rd./Co. 620 South (sign for Roadstown/Greenwich) and continue 4 1/2 miles through Roadstown and Springtown (road changes name several times; follow signs for Co. 620) to end at T intersection. Turn left onto Co. 623/Ye Greate St. and go one mile into Greenwich. Southbound, NJ 42 South/Atlantic City Exit (after Exit 26). Continue 1 1/4 miles on NJ 42 South to Exit 13. Continue south 27 miles on NJ 55 to Exit 32B. Merge onto NJ 56 West and go 7 1/2 miles to end. Turn left onto NJ 77 South and go 2 1/2 miles to traffic light at W. Broad St./NJ 49 (Walgreens on right), in Bridgeton. Turn right onto W. Broad St./NJ 49 West and go 3/4 mile to fourth light (sign for Greenwich/Roadstown on right). Turn left onto S. West Ave. Take second right onto Bowentown Rd./Co. 607 and continue 6 miles on Co. 607 through Bowentown and Sheppards Mill to Greenwich. Eastbound, at blinker light in Shiloh, bear right (not sharp right) onto Roadstown Rd./Co. 620 South (sign for Roadstown/Greenwich) and continue 4 1/2 miles through Roadstown and Springtown (road changes name several times; follow signs for Co. 620) to end at T intersection. Turn left onto Co. 623/Ye Greate St. and go one mile into Greenwich. Westbound, in Bridgeton, at third light after crossing Cohansey River, turn left (sign on right for Greenwich/Roadstown) onto S. West Ave. Take second right onto Bowentown Rd./Co. 607 and continue 6 miles on Co. 607 through Bowentown and Sheppards Mill to Greenwich. Northbound, Exit 24, turn left onto NJ 49 West and continue 13 miles into Bridgeton. After crossing Cohansey River, continue to third light (Broad Street School on right). Turn left onto S. West Ave. Take second right onto Bowentown Rd./Co. 607 and continue 6 miles on Co. 607 through Bowentown and Sheppards Mill to Greenwich. Southbound, Exit 32B, merge onto NJ 56 West and go 7 1/2 miles to end. Turn left onto NJ 77 South and go 2 1/2 miles to traffic light at W. Broad St./NJ 49 (Walgreens on right), in Bridgeton. Turn right onto W. Broad St./NJ 49 West and go 3/4 mile to fourth light (sign for Greenwich/Roadstown on right). Turn left onto S. West Ave. Take second right onto Bowentown Rd./Co. 607 and continue 6 miles on Co. 607 through Bowentown and Sheppards Mill to Greenwich. Site of massacre of soldiers of the American Revolution. Southbound, stay to right through toll booths at end of Turnpike and take first exit, NJ 140/Co 540/Penns Grove/Deepwater. Turn left on Hawks Bridge Rd./Co 540 and continue 7 miles (at 3.8 miles, Hawks Bridge Rd. becomes Pointers-Auburn Rd.) to end. Merge onto NJ 45 South and continue 2 miles to end in Salem. Turn left on Broadway/NJ 49 East and continue 3/4 mile to second light. Turn right on Yorke St. and go 4 miles (name changes to Salem-Hancock's Bridge Rd.) to Hancock's Bridge. Cross Alloway Creek, then take second right onto New St. and continue to parking lot. Northbound: Exit 1C, merge onto Co. 551 South/N. Hook Rd. and continue 4 1/2 miles to end. Turn left onto NJ 49 East and continue 3 miles into Salem. At first light after crossing Salem River, continue straight (NJ 49 turns left) onto S. Front St. and proceed 1/4 mile. Road curves left and becomes Grieves Pkwy. Continue 1 mile to fourth stop sign. Turn right onto Yorke St. and go 3 3/4 miles (name changes to Salem-Hancock's Bridge Rd.) to Hancock's Bridge. Cross Alloway Creek, then take second right onto New St. and continue to parking lot. Southbound: Exit 2B, merge onto Hawks Bridge Rd., cross over New Jersey Turnpike, then follow Turnpike Southbound directions above. Eastbound, in Salem, at first light after crossing Salem River, continue straight (NJ 49 turns left) onto S. Front St. and proceed 1/4 mile. Road curves left and becomes Grieves Pkwy. Continue 1 mile to fourth stop sign. Turn right onto Yorke St. and go 3 3/4 miles (name changes to Salem-Hancock's Bridge Rd.) to Hancock's Bridge. Cross Alloway Creek, then take second right onto New St. and continue to parking lot. Westbound, in Quinton Township, after passing Marty's Crabs on right, turn left onto Harmersville-Pecks Corner Rd. (sign on right for Harmersville) and continue 5 miles to first light. Cross Canton-Harmersville Rd. and continue 3/4 mile to stop sign. Turn left onto Cuff Rd. and continue to first light. Turn right (sign on right for Hancocks Bridge/Salem) onto Locust Island Rd. and continue 1/2 mile to house on left. Recreation of 1888 southern New Jersey glassmaking town. Includes Museum of Glass, which features exhibition of American glassware and glassmaking demonstration. Down Jersey Folklife Center preserves traditions of southern New Jersey. Northbound, US 40 East/Atlantic City Exit. Continue east 24 miles on US 40 to NJ 55 South/Vineland/Millville/Cape May Exit. Merge onto NJ 55 South and continue 12 miles to Exit 26. Turn right, following sign for Millville, onto Co. 555 South, then take first left (sign for Wheaton Arts on right) onto Wade Blvd. and continue 1/2 mile to village entrance on right. Southbound, Exit 3, follow signs for NJ 168 North/Camden/Philadelphia; merge onto NJ 168 North and continue 1 mile to I-295 South/Delaware Memorial Bridge/Walt Whitman Bridge Exit. Merge onto I-295 South and continue 2 miles to NJ 42 South/Atlantic City Exit (after Exit 26), then follow I-295 Southbound directions below. Northbound, after leaving Delaware Memorial Bridge, follow New Jersey Turnpike signs. Continue 3/4 mile on Turnpike to US 40 East/Atlantic City Exit, then follow New Jersey Turnpike Northbound directions above. Southbound, NJ 42 South/Atlantic City Exit (after Exit 26), continue south 1 1/2 miles to Exit 13. Merge onto NJ 55 South and continue 33 miles to Exit 26. Turn right, following sign for Millville, onto Co. 555 South, then take first left (sign for Wheaton Arts on right) onto Wade Blvd. and continue 1/2 mile to village entrance on right. Northbound, Exit 20, merge onto NJ 50 North, cross US 9 and continue north 7 miles on NJ 50 to traffic light in Tuckahoe. Turn left, following sign for NJ 49/Millville/Vineland and continue 16 miles on NJ 49 West to Millville. At second light (sign for Wheaton Arts on right) after passing NJ 55, turn right on Wade Blvd. and go 1 1/4 miles to village entrance on left. Southbound, Exit 38A, merge onto Atlantic City Expwy. West. Continue 4 miles to Exit 12, then follow Atlantic City Expressway Westbound directions below. From Camden area, use NJ 42 and NJ 55 south (see I-295 southbound directions). Westbound, Exit 12, at end of ramp, turn left on Co. 575 and continue to end. Turn right on US 40 West, stay to right through first light and take jughandle, following signs for US 40 West/Mays Landing. Continue on US 40 5 miles into Mays Landing. At Cape May Ave. light, turn left to stay on US 40 West and continue 1 mile to fourth light. Turn left, following sign for Co. 552/Millville/Vineland, onto Co. 552 West and go 12 miles (Millville Ave. becomes Mays Landing Rd.) to E. Sherman Ave. intersection. When Co. 552 turns right on E. Sherman Ave., continue straight on Spur Co. 552/Mays Landing Rd. (becomes E. Broad St.) 2 1/2 miles to first light, just after NJ 55 overpass (sign for Wheaton Arts on right). Turn right on Wade Blvd. and go 3/4 mile to village entrance on left. From NJ 55, Exit 26, Northbound, turn left, Southbound, turn right, onto Co. 555 South/Wheaton Ave. and continue 1/4 mile. Turn left (sign on right for WheatonArts) onto Wade Blvd. and continue 1/2 mile to village entrance on right. Eastbound, in Franklin Township, NJ 55 South/Vineland/Millville/Cape May Exit. Merge onto NJ 55 South and continue 12 miles to Exit 26. Turn right, following sign for Millville, onto Co. 555 South, then take first left (sign for Wheaton Arts on right) onto Wade Blvd. and continue 1/2 mile to village entrance on right. Westbound, in Hamilton Township, after passing through Mays Landing, at traffic light at Co. 552. Turn left, following sign for Co. 552 West/Milmay/Millville/Vineland, onto Co. 552 West and go 12 miles (Millville Ave. becomes Mays Landing Rd.) to E. Sherman Ave. intersection. When Co. 552 turns right on E. Sherman Ave., continue straight on Spur Co. 552/Mays Landing Rd. (becomes E. Broad St.) 2 1/2 miles to first light, just after NJ 55 overpass (sign for Wheaton Arts on right). Turn right on Wade Blvd. and go 3/4 mile to village entrance on left. Northbound, in Millville, at traffic light at Broad St. (Ourz Chicken and Fish on right), turn right onto Broad St. and continue 1 mile to fourth light. Turn left onto Co. 678 North/Wade Blvd. and continue 3/4 mile to village entrance on left. Southbound, in Vineland, NJ 55 South/Wildwood Exit. Merge onto NJ 55 South and continue 3/4 mile to Exit 26, then follow NJ 55 Southbound directions above. From NJ 49, at traffic light at Wade Blvd. (sign on right for WheatonArts), Eastbound, turn left, Westbound, turn right, onto Wade Blvd. and continue 1 1/4 miles to village entrance on left. Burt St. and Babe Ruth Dr.
Museum honors local sports figures of national reputation and contains memorabilia of many others. Northbound, after crossing Delaware Memorial Bridge, follow signs for I-295 North to Exit 1C, then follow I-295 Northbound directions below. Southbound, Exit 3, follow signs for NJ 168 North/Camden/Philadelphia. Merge onto NJ 168 North and go 1 mile to I-295 South/Walt Whitman Bridge/Delaware Memorial Bridge Exit. Merge onto I-295 South and go 2 miles to NJ 42 South/Atlantic City Exit (after Exit 26), then follow I-295 Southbound directions below. Northbound, Exit 1C, merge onto Co. 551 South/N. Hook Rd. and continue 4 1/2 miles to end. Turn left onto NJ 49 East and continue 3 miles into Salem. At first light after crossing Salem River, turn left to stay on NJ 49 East and continue 16 miles into Bridgeton. At first light in Bridgeton (Broad Street School on opposite left corner), turn left on S. West Ave. and go 1/4 mile. Take second right onto Burt St. and continue to museum. Southbound, NJ 42 South/Atlantic City Exit (after Exit 26). Merge onto NJ 42 South and continue 2 miles to Exit 13. Merge onto NJ 55 South and continue 28 miles to Exit 32B, then follow NJ 55 Southbound directions below. From NJ 49, in Bridgeton, at traffic light at S. West Ave., Eastbound, turn left (Bridgeton Christian School on right), Westbound, turn right (Broad Street Elementary School on right), onto S. West Ave. and go 1/4 mile. Take second right onto Burt St. and continue to museum. Northbound, Exit 24, turn left onto NJ 49 West and continue 13 miles into Bridgeton. After crossing Cohansey River, continue to third light (Broad Street School on right). Turn right onto S. West Ave. and continue 1/2 mile. Take second right onto Burt St. and continue to museum. Southbound, Exit 32B, merge onto NJ 56 West and go 7 miles to end. Turn left on NJ 77 South and go 2 1/2 miles to traffic light (Walgreens on right) at Broad St./NJ 49 in Bridgeton. Turn right on Broad St./NJ 49 West and go 3/4 mile to fourth light. Turn right (Broad Street School on right) on S. West Ave. and go 1/2 mile. Take second right onto Burt St. and continue to museum. From NJ 77, Southbound, in Bridgeton, at traffic light at E. Commerce St., turn right onto E. Commerce St. and continue 3/4 mile to end. Turn right onto West Ave. N. and continue 1/4 mile. After passing West Avenue School, take next right onto Burt St. and continue to museum. Museum focuses on the Native American cultures of the area prior to and during the early years of European settlement. Indian artifacts, particularly those composed of local stone, and many fossils found in the area are exhibited. Northbound, US 40 East/Atlantic City Exit. At end of ramp, bear right, following signs for Co. 540. Merge onto Co. 540 East/Hawks Bridge Rd. and continue 6 1/2 miles (name changes to Pointers-Auburn Rd.) to end. Merge onto NJ 45 South and continue 2 miles to end in Salem. Turn left (sign for Bridgeton/Millville) onto NJ 49 East/E. Broadway and continue 12 miles into Shiloh, then follow NJ 49 Eastbound directions below. Southbound, Exit 3, follow signs for NJ 168 North/Camden/Philadelphia. Merge onto NJ 168 North and continue 3/4 mile to I-295 South/Delaware Memorial Bridge/Walt Whitman Bridge Exit. Merge onto I-295 South and continue 2 miles to NJ 42 South/Atlantic City Exit (after Exit 26), then follow I-295 South directions below. Northbound, after crossing Delaware Memorial Bridge, follow signs for New Jersey Turnpike. Continue 3/4 mile on Turnpike to US 40 East/Atlantic City Exit, then follow New Jersey Turnpike Northbound directions above. Southbound, NJ 42 South/Atlantic City Exit (after Exit 26), follow NJ 42 South 2 1/2 miles to Exit 13. Follow NJ 55 South 11 1/2 miles to Exit 48. Turn right onto Ellis Mill Rd. and continue 4 miles to end (name changes to Ferrell Rd.). Turn left onto NJ 77 South/Bridgeton Pike and continue 3 3/4 miles to traffic circle at US 40. Take third exit off circle (NJ 77 South) and continue 6 1/2 miles to blinker light in Deerfield. Turn right (sign for Cohansey on right) onto Co. 540 West/Deerfield Rd. and continue 3 1/4 miles to blinker light/stop sign at Cohansey-Friesburg Rd. Turn left onto Cohansey-Friesburg Rd. and continue 2 1/4 miles (name changes to Old Cohansey Rd.) to junction with NJ 49. Continue straight onto NJ 49 East 3/4 mile into Shiloh. At blinker light, bear right onto Co. 620/Roadstown-Shiloh Rd. (middle road of three that intersect from the right; sign for Roadstown/Greenwich on right) and continue 3 1/2 miles to junction with Co. 650. Turn left onto Co. 650/Sheppards Mill Rd. and continue 3/4 mile to stop sign at Co. 607 intersection. Turn right onto Co. 607/Bridgeton Rd. and continue 1 3/4 miles into Greenwich. Museum is on the right, just before stop sign. Eastbound, in Shiloh, at blinker light, bear right onto Co. 620/Roadstown-Shiloh Rd. (middle road of three that intersect from the right; sign for Roadstown/Greenwich on right) and continue 3 1/2 miles to junction with Co. 650. Turn left onto Co. 650/Sheppards Mill Rd. and continue 3/4 mile to stop sign at Co. 607 intersection. Turn right onto Co. 607/Bridgeton Rd. and continue 1 3/4 miles into Greenwich. Museum is on the right, just before stop sign. Westbound, in Bridgeton, at third light after crossing Cohansey River, turn left (sign on right for Greenwich/Roadstown) onto S. West Ave. Take second right onto Bowentown Rd./Co. 607 and continue 6 miles on Co. 607 through Bowentown and Sheppards Mill to Greenwich. Museum is on the right, just before stop sign. Mid 19th-century farmhouse that once stood at the terminus of a ferry to Delaware contains artifacts of the period. Also on the property are the Maritime Museum, featuring exhibits of the local shad and sturgeon industry and the Riverview Beach Park Museum. From I-295: Northbound, Exit 1A, Southbound, Exit 1, merge onto NJ 49 East and continue 3/4 mile. Turn right onto Church Landing Rd. (St. George's Episcopal Church on corner) and continue 1/2 mile to house on right. Northbound, after leaving Delaware Memorial Bridge, follow I-295 Northbound directions above. Southbound, at southern end of Turnpike, merge onto I-295 South and continue to Exit 1, then follow I-295 Southbound directions above. From NJ 49, in Pennsville, at junction with Church Landing Rd. (St. George's Church on corner), Eastbound, turn right, Westbound, turn left onto Church Landing Rd. and continue 1/2 mile to house on right. From US 130, Southbound, in Pennsville, at southern end, at junction with I-295/US 40, continue straight onto NJ 49 East 3/4 mile. Turn right (St. George's Church on corner) onto Church Landing Rd. and continue 1/2 mile to house on right. Museum displays artifacts of the Penns Grove, Carneys Point and Oldmans Township area. Northbound, after leaving Delaware Memorial Bridge, follow signs for I-295 North. Continue 3 1/2 miles to Exit 4, then follow I-295 Northbound directions below. Southbound, Exit 2, follow sign for US 322 West/Swedesboro. Turn left onto US 322 West and continue 4 miles to I-295 South Exit. Merge onto I-295 South and continue 7 1/2 miles to Exit 4, then follow I-295 Southbound directions below. From I-295, Exit 4, Northbound, turn left, Southbound, turn right, onto NJ 48 West and continue 1 3/4 miles to traffic light at US 130/Virginia Ave. in Penns Grove. Cross US 130 and continue 1/2 mile to museum on left. From US 130, in Penns Grove, at traffic light at NJ 48/Main St., Northbound, turn left (Vito's Pizzeria on right), Southbound, turn right (Town Center Mall on left), onto E. Main St. and continue 1/2 mile to museum on left. Museum commemorates "America's First Defense Airport," where 1500 pilots received advanced fighter training, most in P-47s, during World War II. Northbound, US 40 East/Atlantic City Exit. Continue 22 1/2 miles on US 40 East to NJ 55 South/Millville/Vineland/Cape May Exit. Merge onto NJ 55 South and continue 11 1/4 miles to Exit 27, then follow NJ 55 Southbound directions below. Southbound, Exit 3, follow signs for NJ 168 North/Camden/Philadelphia. Merge onto NJ 168 North and continue 1 mile to I-295 South/Walt Whitman Bridge/Delaware Memorial Bridge Exit. Merge onto I-295 South and continue 1 1/2 miles to NJ 42 South/Atlantic City Exit (after Exit 26). Merge onto NJ 42 South and continue 1 1/2 miles to Exit 13. Follow NJ 55 South 32 miles to Exit 27, then follow NJ 55 Southbound directions below. Northbound, after leaving Delaware Memorial Bridge, follow signs for New Jersey Turnpike. Continue 3/4 mile on Turnpike to US 40 East/Atlantic City Exit. Continue 22 1/2 miles on US 40 East to NJ 55 South/Millville/Vineland/Cape May Exit. Merge onto NJ 55 South and continue 11 1/4 miles to Exit 27, then follow NJ 55 Southbound directions below. Southbound, NJ 42 South/Atlantic City Exit (after Exit 26). Merge onto NJ 42 South and continue 1 1/2 miles to Exit 13. Follow NJ 55 South 32 miles to Exit 27, then follow NJ 55 Southbound directions below. Northbound, Exit 20, cross US 9 and continue north 7 miles on NJ 50 to traffic light in Tuckahoe. Turn left on NJ 49 West and continue 18 miles into Millville. At blinker after crossing Maurice River, turn left (sign for Co. 555 South/Cedarville/Newport on right) on Cedar St. and continue 3 miles to airport entrance on left. Turn left onto Bogden Blvd. and continue 1/2 mile. Take second right (sign on right for museum) onto Peterson St. and continue to end. Turn right onto Leddon St. and continue to museum on right. Southbound, Exit 38A, merge onto Atlantic City Expressway West and continue 5 miles to Exit 12. Follow signs to US 40 West and continue through Mays Landing. Cross Lake Lenape and pass NJ 50 South/Mill St. intersection. At second traffic light, turn left onto Co. 552 West and go 14 miles into Millville (when Co. 552 turns right, continue straight on Spur Co. 552). 1/4 mile after passing under NJ 55, turn left at traffic light onto Wade Blvd. and take Wade Blvd. to first light. Turn right on NJ 49 West, pass through 5 lights and cross Maurice River. Turn left at blinker (sign for Co. 555 South/Cedarville/Newport on right) and go 3 miles on Cedar St. to airport entrance on left. Turn left onto Bogden Blvd. and continue 1/2 mile. Take second right (sign on right for museum) onto Peterson St. and continue to end. Turn right onto Leddon St. and continue to museum on right. Northbound, Exit 24, turn left onto NJ 49 West/E. Main St. and continue 1 3/4 miles through Millville. After crossing Maurice River, turn left at blinker light (sign on right for Co. 555 South/Cedarville/Newport) onto Cedar St. and continue 2 miles to Millville Airport entrance on left. Turn left onto Bogden Blvd. and continue 1/2 mile. Take second right (sign on right for museum) onto Peterson St. and continue to end. Turn right onto Leddon St. and continue to museum on right. Southbound, Exit 27, merge onto NJ 47 South/N. Second St. and continue 1/2 mile to High St. Exit (Target on right). Bear right onto N. High St. and continue 1/4 mile. When road forks, continue straight onto Sharp St. 1 3/4 miles to end. Turn right onto NJ 49 West/W. Main St. and continue 1 mile. Turn left (sign on right for Airport and Museum) onto Rieck Ave. and continue 1 1/2 miles to end. Turn right onto Cedar St. and continue 1/4 mile to Millville Airport entrance on left. Turn left onto Bogden Blvd. and continue 1/2 mile. Take second right (sign on right for museum) onto Peterson St. and continue to end. Turn right onto Leddon St. and continue to museum on right. From NJ 47, in Millville, at traffic light at NJ 49/E. Main St., Northbound, turn left, Southbound, turn right, onto NJ 49 West/E. Main St. and continue 1/4 mile across Maurice River. At blinker light (sign on right for Co. 555 South/Cedarville/Newport), turn left onto Co. 555 South/Cedar St. and continue 2 miles to Millville Airport entrance. Turn left onto Bogden Blvd. and continue 1/2 mile. Take second right (sign on right for museum) onto Peterson St. and continue to end. Turn right onto Leddon St. and continue to museum on right. Eastbound, after passing through Bridgeton, bear right (Stay Inn on right) onto Buckshutem Rd. (sign for Mauricetown/Cape May) and continue 7 3/4 miles to four-way stop at Co. 610/Cedar St. (sign for Millville Airport on right). Turn left onto Co. 610 East/Cedar St. and continue 1 1/4 miles to Millville Airport entrance on right. Turn right onto Bogden Blvd. and continue 1/2 mile. Take second right (sign on right for museum) onto Peterson St. and continue to end. Turn right onto Leddon St. and continue to museum on right. Westbound, in Millville, after crossing Maurice River, at blinker light at Cedar St., turn left (sign for Co. 555 South/Cedarville/Newport on right) and go 3 miles on Cedar St. to airport entrance on left. Turn left onto Bogden Blvd. and continue 1/2 mile. Take second right (sign on right for museum) onto Peterson St. and continue to end. Turn right onto Leddon St. and continue to museum on right. Artifacts of the early days of the Industrial Revolution are presented in the former office of the Cumberland Nail and Iron Company, with emphasis on iron and glass industries. Includes two-faced clock, indoor face for manager, outdoor face for workers. Northbound, Exit 1C, merge onto Co. 551 South/N. Hook Rd. and continue 4 1/2 miles to end. Turn left onto NJ 49 East and continue 3 miles into Salem. At first light after crossing Salem River, turn left to stay on NJ 49 East and continue 17 miles through Quinton and Shiloh to Bridgeton. At third light in Bridgeton, turn left onto Atlantic St. and continue into Bridgeton City Park on Mayor Aitken Dr. Museum is on right. Southbound, NJ 42 South Exit (after Exit 26), merge onto NJ 42 South and continue 2 miles to Exit 13. Merge onto NJ 55 South and continue 28 miles to Exit 32B, then follow NJ 55 Southbound directions below. From NJ 49, in Bridgeton, at traffic light at Atlantic St., Eastbound, turn left (Hankins Lumber on right), Westbound, turn right (first light after crossing Cohansey River), onto Atlantic St. and continue 1/4 mile to museum on right in Bridgeton City Park. Northbound, Exit 24. Turn left onto NJ 49 West and continue 12 1/2 miles through Millville into Bridgeton. After crossing Cohansey River, turn right at first traffic light onto Atlantic St. and continue 1/4 mile to museum on right in Bridgeton City Park. Southbound, Exit 32B. Merge onto NJ 56 West and go 7 miles to end. Turn left on NJ 77 South and go 3 miles into Bridgeton. Turn right on Commerce St., cross river, take first right onto Mayor Aitken Dr. Enter Bridgeton City Park; museum is on right. From NJ 77, Southbound, in Bridgeton, at traffic light at Washington St., turn right onto Washington St. and continue 1/4 mile to end. Turn left onto Mayor Aitken Dr. and continue to museum on left. Local history museum housed in Alexander Grant House exhibits artifacts associated with the area. Tours of Salem homes and surrounding area. Southbound, keep right through toll booth at end of Turnpike and take NJ 140/Co. 540/Penns Grove/Deepwater Exit. Turn left on Hawks Bridge Rd. and continue 3 3/4 miles to intersection with Pointers-Auburn Rd. Continue on Pointers-Auburn Rd. 3 miles to end. Merge onto NJ 45 South and continue 2 miles into Salem to Grant House on right. Northbound, Exit 1C, merge onto Co. 551 South/N. Hook Rd. and continue 4 1/2 miles to end. Turn left onto NJ 49 East and go 3 miles into Salem. After crossing Salem River, turn left at railroad crossing onto Griffith St. and continue 1/2 mile to second light. Turn right onto NJ 45 South/Market St. and continue 1/2 block to Grant House on right. Southbound, Exit 2B, merge onto Hawks Bridge Rd., cross over New Jersey Turnpike and continue 3 3/4 miles to intersection with Pointers-Auburn Rd. Continue on Pointers-Auburn Rd. 3 miles to end. Merge onto NJ 45 South and continue 2 miles into Salem to Grant House on right. From NJ 49, in Salem, at traffic light at NJ 45/Market St., Eastbound, turn left, Westbound, turn right, onto NJ 45 North/Market St. and continue to house on left. Open Monday thru Thursday 9AM-12Noon; closed Aug. Displays artifacts of the Seabrook area, focusing on the once-extensive Seabrook Farms operations. Northbound, US 40 East/Atlantic City Exit. Continue 16 miles on US 40 to Pole Tavern Circle. Take second exit from circle (sign for NJ 77 South) and continue 9 miles on NJ 77 South to Upper Deerfield Municipal Building on left in Seabrook. Southbound, Exit 2, turn right onto US 322 East and continue 3 miles to traffic light in Mullica Hill (sign for Mullica Hill Historic District on right). Turn right on N. Main St./NJ 45 South and continue 1 mile. When NJ 45 splits to right, continue straight (Bridgeton) onto NJ 77 South and proceed 18 miles to Upper Deerfield Municipal Building on left in Seabrook. Northbound, after leaving Delaware Memorial Bridge, follow signs for New Jersey Turnpike. Continue 3/4 mile on Turnpike to US 40 East/Atlantic City Exit, then follow New Jersey Turnpike Northbound directions above. Southbound, NJ 42 South/Atlantic City Exit (after Exit 26). Merge onto NJ 42 South and continue 1 1/2 miles to Exit 13. Follow NJ 55 South 11 miles to Exit 48, then follow NJ 55 Southbound directions below. Northbound, Exit 32B, merge onto NJ 56 West and continue 2 1/2 miles. After passing Rainbow Lake on right, take second right onto Big Oak Rd. and continue 5 miles to end. Turn right onto NJ 77 North and continue 3/4 mile to Upper Deerfield Municipal Building on right. Southbound, Exit 48, turn right onto Co. 641 South/Ellis Mill Rd. and continue 4 miles (name changes to Ferrell Rd.) to end. Turn left onto NJ 77 South and continue 3 3/4 miles to traffic circle. Take third exit from circle to stay on NJ 77 South and continue 9 miles to Upper Deerfield Municipal Building on left in Seabrook. Museum of Vineland's history includes the Great Hall meeting room, which has artifacts of town founder Charles Landis, examples of glass produced in Vineland, Landis Family Room and historical displays pertaining to Vineland. Northbound, US 40 East/Atlantic City Exit, follow US 40 East 23 miles to NJ 55 South/Vineland/Millville/Cape May Exit. Merge onto NJ 55 South and continue 6 1/2 miles to Exit 32A, then follow NJ 55 directions below. Southbound, Exit 3, follow signs for NJ 168 North/Camden/Philadelphia. Merge onto NJ 168 North and continue 3/4 mile to second light. Turn left onto W. Browning Rd. and continue 1/2 mile. When road forks, bear left onto Creek Rd. and continue 3/4 mile. After crossing over NJ 42, take first left onto Harding Ave. and follow signs to NJ 42 South. Merge onto NJ 42 South and continue 1 mile to Exit 13. Follow NJ 55 South 28 miles to Exit 32A, then follow NJ 55 directions below. Northbound, after leaving Delaware Memorial Bridge, follow signs for New Jersey Turnpike. Continue on Turnpike 3/4 mile to US 40 East/Atlantic City Exit. Follow US 40 East 23 miles to NJ 55 South/Vineland/Millville/Cape May Exit. Merge onto NJ 55 South and continue 6 1/2 miles to Exit 32A, then follow NJ 55 directions below. Southbound, NJ 42/Atlantic City Exit (after Exit 26), continue 1 1/2 miles on NJ 42 South to Exit 13. Follow NJ 55 South 28 miles to Exit 32A, then follow NJ 55 directions below. Eastbound, NJ 55 South/Vineland/Millville/Cape May Exit, merge onto NJ 55 South and continue 6 1/2 miles to Exit 32A, then follow NJ 55 directions below. Westbound, 5 miles west of Mays Landing, turn left onto Old Landis Ave. (Jo Jo's Pizzeria on left) and continue 4 miles to traffic light at Tuckahoe Rd. Cross Tuckahoe Rd. and continue 6 1/2 miles on Landis Ave. into Vineland to traffic light at S. East Ave. (just past Sacred Heart Church). Turn left onto S. East Ave. and continue 2 blocks. Turn right onto E. Grape St. and continue 2 blocks. Turn right onto S. Seventh St. and continue to museum on left. From NJ 47, in Vineland, at traffic light at NJ 56/Landis Ave., Northbound, turn right (Rite Aid on right), Southbound, turn left (Walgreens on right), onto NJ 56 East/E. Landis Ave. and continue 1 1/4 miles to traffic light at Eighth St. (third light after crossing railroad tracks). Turn right onto S. Eighth St. and continue two blocks. Turn right onto E. Grape St. and continue 1 block to stop sign. Turn right onto S. Seventh St. and continue to museum on left. From NJ 55, Exit 32A, merge onto NJ 56 East/Landis Ave. and continue 2 1/2 miles to traffic light at Eighth St. (third light after crossing railroad tracks). Turn right onto S. Eighth St. and continue two blocks. Turn right onto E. Grape St. and continue 1 block to stop sign. Turn right onto S. Seventh St. and continue to museum on left. Museum located in Bridgeton Public Library exhibits 20,000 artifacts relating to Lenni-Lenape natives of the area. Southbound, Exit 3, follow signs for NJ 168 North/Camden/Philadelphia. Merge onto NJ 168 North and go 1 mile to I-295 South/Walt Whitman Bridge/Delaware Memorial Bridge Exit. Merge onto I-295 South and continue 2 miles to NJ 42/Atlantic City Exit (after Exit 26). Merge onto NJ 42 South and continue 1 1/2 miles to Exit 13. Continue on NJ 55 South 28 miles to Exit 32B, then follow NJ 55 Southbound directions below. Northbound, Exit 1C, merge onto Co. 551 South/N. Hook Rd. and continue 4 1/2 miles to end. Turn left onto NJ 49 East and continue 3 miles into Salem. At first light after crossing Salem River, turn left to stay on NJ 49 East and continue 17 miles through Quinton and Shiloh into Bridgeton. After crossing river, continue to second light (sign for NJ 77 North/Mullica Hill on right). Turn left onto NJ 77 North/N. Pearl St. and continue to first light. Turn right onto E. Commerce St. and continue 1 block to museum in library on right. Southbound, NJ 42/Atlantic City Exit (after Exit 26), merge onto NJ 42 South and continue 1 1/2 miles to Exit 13. Continue on NJ 55 South 28 miles to Exit 32B, then follow NJ 55 Southbound directions below. Northbound, Exit 24, turn left onto NJ 49 West/E. Main St. and continue 11 1/2 miles through Millville into Bridgeton. After crossing railroad tracks, continue straight (NJ 49 curves left) onto E. Commerce St. (sign for Mullica Hill/Camden) and continue 3/4 mile to second light, at Bank St. Museum is in library on opposite left corner. Southbound, Exit 32B, merge onto NJ 56 West and go 7 miles to end. Turn left on NJ 77 South and go 3 miles to traffic light at E. Commerce St. in Bridgeton. Turn left on E. Commerce St. and continue to museum in library on right. Eastbound, in Bridgeton, at traffic light at NJ 77/Pearl St. (second light after crossing river), turn left onto NJ 77 North/Pearl St. and continue to first light. Turn right onto E. Commerce St. and continue to museum in library on right at Bank St. Westbound, in Bridgeton, after crossing railroad tracks, continue straight, following sign for Mullica Hill/Camden, onto E. Commerce St. and continue 3/4 mile to second light, at Bank St. Museum is in library on opposite left corner. From NJ 77, Southbound, in Bridgeton, at traffic light at E. Commerce St., turn left onto E. Commerce St. and continue 1 block to museum in Bridgeton Library on right. State park containing late 19th-century fortifications, observed along self-guiding trail. Boating, fishing, picnicking. Seasonal passenger ferry to Fort Delaware on Pea Patch Island (Civil War prison) and Fort DuPont in Delaware; reservations are suggested at 1-877-98-PARKS or at ferry website. Northbound, after leaving Delaware Memorial Bridge, take Exit 1A, then follow I-295 directions below. Southbound, at southern end of Turnpike, continue on I-295 South to Exit 1, then follow I-295 directions below. From I-295, Northbound, Exit 1A, Southbound, Exit 1, merge onto NJ 49 East and continue 2 1/2 miles through Pennsville to fifth light (sign for Fort Mott on right); turn right on Fort Mott Rd. and go 3 miles to park entrance on right. Eastbound, in Pennsville, at traffic light at Fort Mott Rd. (sign for Fort Mott on right), turn right on Fort Mott Rd. and go 3 miles to park entrance on right. Westbound, in Pennsville, bear left (sign on right for Fort Mott) onto Harrisonville Lighthouse Rd. and continue 2 1/4 miles. Bear left at fork (Finns Point Lighthouse on left) and continue 1 1/2 miles on Fort Mott Rd. to park entrance on right. From US 130, Southbound, in Pennsville, at southern end, at junction with I-295/US 40, continue east on NJ 49 3 1/2 miles through Pennsville. At traffic light at Fort Mott Rd. (sign on right for Fort Mott/Finns Point Cemetery), turn right and continue 3 miles to park entrance on right. Preserve encompasses high ground on the west bank of the Maurice River, a designated Wild and Scenic River. Five miles of trails are accessible to most hikers offering an opportunity to observe local wildlife, including bald eagles. Facilities are also available for picnicking. Northbound, Cape May/Wildwood area traffic use NJ 47 North and follow directions below. Southbound, Exit 27, merge onto NJ 47 South/N. Second St. and continue 2 miles to traffic light at E. Main St. in Millville. Turn right onto E. Main St. and continue 1/4 mile across Maurice River to blinker light. Turn left (sign on right for Co. 555 South/Cedarville/Newport) onto Cedar St. and continue 1/4 mile to first light. Turn left onto Race St. and continue 1 1/4 miles. When Co. 555 turns right, continue straight on Co. 627/Silver Run Rd. 1 1/2 miles to preserve entrance on left. Westbound, after passing junction with NJ 50 South in Mays Landing, continue 1 1/2 miles to second light. Turn left (sign for Co. 552 West/Milmay/Millville/Vineland on right) and continue to T intersection, then turn right and follow Co. 552 West 14 1/2 miles (at Sherman Ave., Co. 552 turns right; continue straight on Spur Co. 552). At first light after NJ 55 interchange, turn left onto Wade Blvd. and continue 1/2 mile. Bear right (sign for NJ 49 West/Bridgeton/Salem on right) onto NJ 49 West/E. Main St. and continue 1 1/4 miles across Maurice River to blinker light. Turn left (sign on right for Co. 555 South/Cedarville/Newport) onto Cedar St. and continue 1/4 mile to first light. Turn left onto Race St. and continue 1 1/4 miles. When Co. 555 turns right, continue straight on Co. 627/Silver Run Rd. 1 3/4 miles to preserve entrance on left. Northbound, in Maurice River Township, turn left at traffic light at Co. 670/Mauricetown Rd. and continue 1 1/2 miles across Maurice River to blinker light. Turn right onto E. Buckshutem Rd. and continue 4 miles. In Laurel Lake, bear right (follow sign for Glasstown Arts District) onto Silver Run Rd. and continue 1 1/4 miles to preserve entrance on right. Southbound, in Millville, at junction with NJ 49/E. Main St., turn right onto NJ 49 West/E. Main St. and continue 1/4 mile across Maurice River to blinker light, then follow NJ 49 Westbound directions below. Eastbound, in Millville, at traffic light at Brandriff Ave. (sign on right for Sports Complex/Army Air Field Museum), turn right onto Brandriff Ave. and continue 1/4 mile to first light. Cross Cedar St. and continue 1 1/4 miles on Co. 555 South/S. Race St. When Co. 555 bears right at Dividing Creek Rd., continue straight (sign for Laurel Lake/Mauricetown) on Co. 627/Silver Run Rd. 1 1/2 miles to preserve entrance on left. Westbound, in Millville, at blinker light after crossing Maurice River, turn left (sign on right for Co. 555 South/Cedarville/Newport) onto Co. 555 South/Cedar St. and continue 1/4 mile to first light. Turn left onto S. Race St., following sign for Co. 555 South, and continue 1 1/4 miles. When Co. 555 bears right at Dividing Creek Rd., continue straight (sign for Laurel Lake/Mauricetown) on Co. 627/Silver Run Rd. 1 1/2 miles to preserve entrance on left. State park in southern New Jersey on the fringes of the Pine Barrens, including both pine and hardwood forests. Biking, boating, camping, fishing, hiking, swimming, picnicking. Several southern New Jersey environments may be observed in Parvin Natural Area. Northbound, US 40 East/Atlantic City Exit. Continue east 16 miles on US 40 through Woodstown to Pole Tavern Circle (jct NJ 77). Take third exit (US 40 East) off circle and continue on US 40 East 3 1/2 miles into Elmer. At light, turn right on S. Main St. and continue 1/2 mile to stop sign. Turn left on Centerton Rd. and continue 5 miles (in Olivet, Centerton Rd. becomes Co. 553) to Centerton. At light, turn left (sign for Parvin State Park) on Almond Rd./Co. 540 and go 2 miles to parking lot on left, across from office. Southbound, Exit 3, follow signs for NJ 168 North/Camden/Philadelphia. Merge onto NJ 168 North and go 1 mile to I-295 South/Walt Whitman Bridge/Delaware Memorial Bridge Exit. Merge onto I-295 South and continue 1 1/2 miles to NJ 42/Atlantic City Exit (after Exit 26). Continue south 1 1/2 miles on NJ 42 to Exit 13. Follow NJ 55 South 28 miles to Exit 32B, then use NJ 55 Southbound directions below. Southbound, NJ 42/Atlantic City Exit (after Exit 26). Continue south 1 1/2 miles on NJ 42 to Exit 13. Follow NJ 55 South 28 miles to Exit 32B, then use NJ 55 Southbound directions below. Eastbound, in Pittsgrove Township, at traffic light at Co. 553/Buck Rd. (sign on right for Centerton/Parvin St. Pk. ), turn right onto Co. 553 South/Buck Rd. and continue 3 1/2 miles into Centerton (name changes to Centerton Rd.). At traffic light in Centerton, turn left onto Co. 540 East/Almond Rd. and continue 2 1/4 miles to parking lot on left. Westbound, in Malaga, at junction with NJ 47 South. Continue straight on NJ 47 South 2 miles to first light. Turn right onto Weymouth Rd. and continue 1 1/2 miles (name changes to Willow Grove Rd.). After passing Willow Grove Lake, take first left (unmarked) onto Parvin Mill Rd. and continue 4 1/4 miles to second stop sign, at Almond Rd. Turn right onto Almond Rd. and continue 1/4 mile to parking lot on right. From NJ 55, Exit 32B, merge onto NJ 56 West and continue 3/4 mile to first light. Turn right on Gershal Ave./Co. 638 and go 3/4 mile to first light, in Norma. Turn left on Almond Rd./Co. 540 and go 2 1/4 miles to parking lot on right, across from office. Northbound, in Upper Deerfield Township, at traffic light at NJ 56, bear right onto NJ 56 East (sign for NJ 56 East/Vineland) and continue 1 1/4 mile. After passing traffic light at Co. 553/S. Woodruff Rd., bear left onto Parvins Mill Rd. (sign on right for Willow Grove) and continue 4 1/4 miles to third four-way stop, at Almond Rd. Turn left onto Almond Rd. and continue to parking area on right, across from office. Southbound, in Upper Deerfield Township, at blinker light at Co. 540/Deerfield Rd. in village of Deerfield, turn left (sign for Centerton) onto Co. 540 East/Deerfield Rd. and continue 3 3/4 miles to T intersection in Centerton. Turn left onto Centerton Rd. and continue to traffic light. Bear right onto Co. 540 East/Almond Rd. and continue 2 1/4 miles to parking lot on left, opposite park office. Schooner A.J. Meerwald, constructed as an oyster dredge in 1928, has been restored as an educational venture and is recognized as New Jersey's Official Tall Ship. Housed in the historic oyster sheds, the Delaware Bay Museum displays exhibits that highlight the oyster industry and life in the Delaware Bay region. Sailings take place in Delaware Bay, Delaware River, Atlantic Ocean, northern New Jersey. Check schedule. Directions are to home port in Bivalve. Northbound, Exit 10, turn left (Co. 657 West/Cape May Court House) and continue 1/4 mile to first light. Cross US 9 and continue 6 miles on Co. 657 West/Court House-South Dennis Rd. to end. Turn right onto NJ 47 North and continue 4 miles to traffic light at junction with NJ 347. Continue straight on NJ 347 8 1/4 miles to first light. Turn left (sign for Co. 670/Mauricetown/Port Norris) and continue 3 1/2 miles on Mauricetown Rd./Mauricetown Bypass to end. Turn left on North Ave. and go 3 miles to end in Port Norris. Turn right on Main St. and go 1/2 mile. Turn left on High St. and go 1 mile to center in Bivalve. Southbound, Exit 17, turn left on Sea Isle Blvd. and continue to end. Turn left on US 9 South and go 2 miles. Turn right on NJ 83 West and continue 4 miles to end. Turn right on NJ 47 North and go 3 1/2 miles to traffic light at junction with NJ 347. Continue straight on NJ 347 8 1/4 miles to first light. Turn left (sign for Co. 670/Mauricetown/Port Norris) and continue 3 1/2 miles on Mauricetown Rd./Mauricetown Bypass to end. Turn left on North Ave. and go 3 miles to end in Port Norris. Turn right on Main St. and go 1/2 mile. Turn left on Co. 631 South/High St. and go 1 mile to center in Bivalve. From NJ 47, in Maurice River Township, at traffic light at Co. 670/Mauricetown Rd., Northbound, turn left, Southbound, turn right, onto Mauricetown Rd./Mauricetown Bypass and continue 3 1/2 miles to end. Turn left on North Ave. and go 3 miles to end in Port Norris. Turn right on Main St. and go 1/2 mile. Turn left on High St. and go 1 mile to center in Bivalve. Salem County winery provides sampling of wines in tasting room, as well as periodic events in the vineyard. Southbound, Exit 2, turn left onto US 322 West and continue 1 1/4 miles to first light. Turn left (sign for Co. 551 South/Swedesboro) onto Co. 551 South/Kings Hwy. and continue 1 1/4 miles to second light, in Swedesboro. Bear right (not sharp right) to stay on Co. 551 South and continue 3 1/2 miles. When Co. 551 turns right in Auburn, continue straight and take next left onto Pedricktown-Woodstown Rd. Cross over New Jersey Turnpike, then take first right onto Sharptown-Auburn Rd. and continue 2 1/4 miles to winery on right. Northbound, after leaving Delaware Memorial Bridge, follow signs for New Jersey Turnpike/US 40. Continue 3/4 mile on New Jersey Turnpike to US 40 East/Atlantic City Exit, then follow New Jersey Turnpike directions above. Southbound, Exit 7, turn left onto Straughns Mill Rd., cross over I-295 and continue 3/4 mile to stop sign. Turn left onto Perkintown Rd. and continue 1 1/2 miles to end. Turn left onto Pennsville-Auburn Rd. and continue 3/4 mile. Take second right onto Pedricktown-Woodstown Rd. and continue 1/2 mile. After crossing over New Jersey Turnpike, take first right onto Sharptown-Auburn Rd. and continue 2 1/4 miles to winery on right. Eastbound, in Pilesgrove Township, after passing Cowtown Farmers Market/Rodeo on right, take next left onto Sharptown-Auburn Rd. and continue 1 mile to winery on left. Westbound, at traffic light in Sharptown (La Rosa Greenhouses on right), continue straight on US 40 West, then take third right onto Sharptown-Auburn Rd. and continue 1 mile to winery on left. From NJ 45, in Pilesgrove Township, at traffic light at US 40, Northbound, turn left (Pilesgrove Town Center on left), Southbound, turn right (Lawnside Cemetery on right), onto US 40 West and continue 2 miles. Turn right (third right after passing light in Sharptown) onto Sharptown-Auburn Rd. and continue 1 mile to winery on left. Winery near the Delaware River offers sampling in its tasting room during business hours. Northbound, after leaving Delaware Memorial Bridge, follow signs for I-295 North and continue 6 1/4 miles to Exit 7, then follow I-295 Northbound directions below. Southbound, Exit 2, turn left onto US 322 West and continue 4 miles to I-295 South Exit. Merge onto I-295 South and continue 1 3/4 miles to Exit 10, then follow I-295 Southbound directions below. Northbound, Exit 7, turn left onto Straughns Mill Rd. and continue 2 miles. Turn right (small sign for Pedricktown on right) onto W. Mill St. and continue 1/2 mile to four-way stop in Pedricktown. Turn left onto N. Railroad Ave. and continue 1/4 mile to winery on left. Southbound, Exit 10, turn right onto Center Square Rd. and continue 1 mile. After passing Union United Methodist Church, take next left onto Pedricktown Rd. and continue 1 1/2 miles to four-way stop in Pedricktown. Turn right onto N. Railroad Ave. and continue 1/4 mile to winery on left. From US 322, in Logan Township, I-295 South Exit. Merge onto I-295 South and continue 1 3/4 miles to Exit 10, then follow I-295 Southbound directions above. From US 130, in Oldmans Township, Northbound, turn right onto N. Railroad Ave. (second right after passing Pedricktown Cogeneration Plant), Southbound, after crossing Oldmans Creek, take first left onto N. Railroad Ave., Both, continue 1 mile on N. Railroad Ave. to winery on right. New Jersey's first zoo has over 200 animals on its grounds. Southbound, Exit 3, follow signs for NJ 168 North/Camden/Philadelphia. Merge onto NJ 168 North and go 1 mile to I-295 South/Walt Whitman Bridge/Delaware Memorial Bridge Exit. Merge onto I-295 South and continue 1 1/2 miles to NJ 42 South/Atlantic City Exit (after Exit 26). Merge onto NJ 42 South and continue 1 1/2 miles to Exit 13. Merge onto NJ 55 South and continue 28 miles to Exit 32B, then follow NJ 55 Southbound directions below. Northbound, Exit 1C, merge onto Co. 551 South/N. Hook Rd. and continue 4 1/2 miles to end. Turn left onto NJ 49 East and go 3 miles into Salem. At first light after crossing Salem River, turn left to stay on NJ 49 East and continue 15 miles through Salem and Shiloh to traffic light at W. Park Dr. in Bridgeton (West Park United Methodist Church on left). Turn left onto W. Park Dr. and continue 1 1/4 miles to traffic light at West Ave. Cross West Ave., then take next right onto Mayor Aitken Dr. and continue to zoo on left. Southbound, NJ 42 South/Atlantic City Exit (after Exit 26). Merge onto NJ 42 South and continue 1 1/2 miles to Exit 13. Merge onto NJ 55 South and continue 28 miles to Exit 32B, then follow NJ 55 Southbound directions below. From NJ 49, in Bridgeton, at traffic light at Atlantic St., Eastbound, turn left, Westbound, turn right, onto Atlantic St. and continue 1 mile to zoo in Bridgeton City Park. Northbound, Exit 24. Turn left onto NJ 49 West and continue 12 1/2 miles through Millville into Bridgeton. After crossing Cohansey River, turn right at first traffic light onto Atlantic St. and continue 1 mile to zoo in Bridgeton City Park. Southbound, Exit 32B, merge onto NJ 56 West and go 7 miles to end. Turn left on NJ 77 South and go 3 miles into Bridgeton to traffic light at Commerce St. Turn right on Commerce St. and cross river. Take first right onto Mayor Aitken Dr. and proceed 1 mile into Bridgeton City Park to zoo on right. From NJ 77, Southbound, in Bridgeton, at traffic light at Washington St., turn right onto Washington St. and continue 1/4 mile across Cohansey River to end. Turn right onto Mayor Aitken Dr. and continue 1/2 mile to zoo on right. 2800-acre refuge hosts a multitude of shore birds and waterfowl during all four seasons. Hiking and boat trails allow observation of wildlife. Northbound, Exit 1A, merge onto NJ 49 East and continue 2 1/2 miles through Pennsville to fifth light (sign on right for Fort Mott State Park). Turn right on Fort Mott Rd. and continue 1 1/2 miles. At fork, bear left on Lighthouse Rd. At stop sign opposite Finns Point Lighthouse, turn right and continue to refuge office, just past lighthouse on left. Southbound, Exit 1C, merge onto N. Hook Rd. and continue 4 1/2 miles to end. Turn left on NJ 49 East and continue 3/4 mile. Take first right (sign for refuge on right) and go 1 1/2 miles on Lighthouse Rd./Co. 632 to office on left, at Finns Point Lighthouse. Northbound, after leaving Delaware Memorial Bridge, take Exit 1A, then follow I-295 Northbound directions above. Southbound, at southern end of Turnpike, continue on I-295 South to Exit 1, then follow I-295 Northbound directions above. Eastbound, in Pennsville, at traffic light at Fort Mott Rd. (sign for Fort Mott on right), turn right on Fort Mott Rd. and go 1 1/2 miles. At fork, bear left on Lighthouse Rd. At stop sign opposite Finns Point Lighthouse, turn right and continue to refuge office, just past lighthouse on left. Westbound, in Pennsville, bear left (sign on right for Fort Mott) onto Harrisonville Lighthouse Rd. and continue 2 1/4 miles. Bear left at fork (Finns Point Lighthouse on left) and continue to park office on left, just past lighthouse. From US 130, Southbound, in Pennsville, at southern end, at junction with I-295/US 40, continue east on NJ 49 3 1/2 miles through Pennsville. At traffic light at Fort Mott Rd. (sign on right for Fort Mott/Finns Point Cemetery), turn right and continue 1 1/2 miles on Fort Mott Rd. When road forks, keep left and continue 1/4 mile to stop sign opposite Finns Point Lighthouse. Turn right and continue to refuge headquarters just past lighthouse on left.